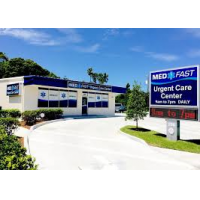 Medfast Urgent Care Center located in Melbourne offers many of the same services as hospital Emergency Rooms, but much faster and in a convenient, professional environment. Our walk in clinic sees and treats most patients in less than an hour. Whether you have minor emergencies or illness, work related injuries, or simply need a physical, our Urgent Care Clinics will suit your needs. We are open seven days a week, from 9:00 am to 7:00 pm.